hi every 1 i have added armatures to my gingerbread man many times and its worked perfect but i have a model my friend made and i want to add armatures so i can make some movies but i cant because every time i try to make parent it doesn’t do it right. If some 1 can point me in the right direction with a tutorial i would highly appreciate it. 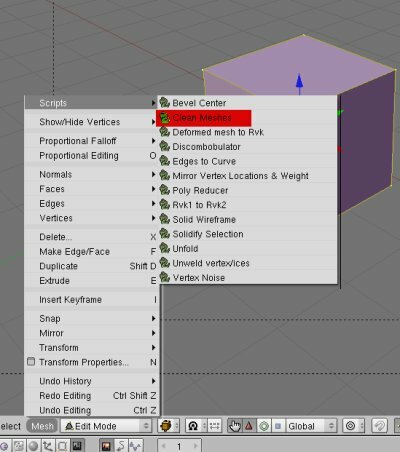 AUTOSMOOTH…TEXTMESH…CENTERNEW… and so forth i dont see mesh clean up what do i do?? It’s a script. And what you will be using it for is to remove all the edges that do not have faces in the model. You could also do this by hand, but the script should do it quickly and easily.